Witnessing a compound annual growth rate (CAGR) of 11.8 per cent over 2016-21, the Indian Media and Entertainment industry is expected to touch USD 34.8 billion, says to a report titled ’Digital inflection point: Indian media and entertainment’ released by Ernst & Young at the FICCI-IIFA Global Business Forum in New York. India remains an advertising-driven market in 2020 with the total ad spend across all segments estimated to reach USD 16.69 billion in 2020. In 2016, it stood at USD 8.18 billion. 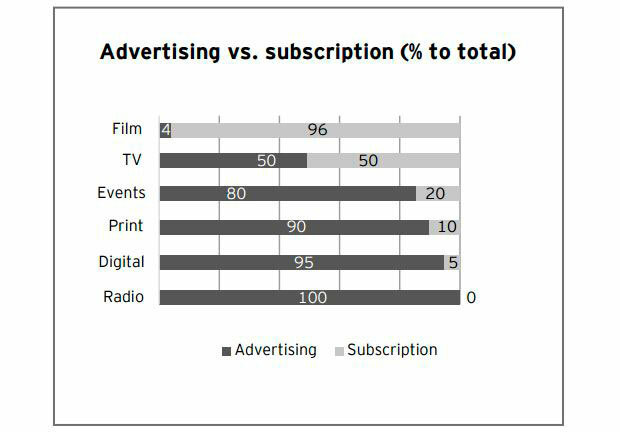 While radio is the only segment with 100 per cent revenue from advertising, digital and print are closest next with 95 per cent and 90 per cent of its revenue coming from advertising, respectively. TV gets 50 per cent. Mobile advertising has emerged as the third largest advertising medium in India after TV and print, notes the report. Digital is expected to grow at the fastest pace of 26 per cent. The key drivers are the fact that India will be the second largest smartphone market by 2017, high-speed broadband penetration is expected to reach 53 per cent by 2020, 746 million internet subscribers are expected in 2020, 450 million digital video viewers are expected in 2020, rural internet users (388 million) to exceed urban internet users (358 million) by 2020 and that the face of new digital India is expected to be far more diverse with the emergence of user groups such as women. 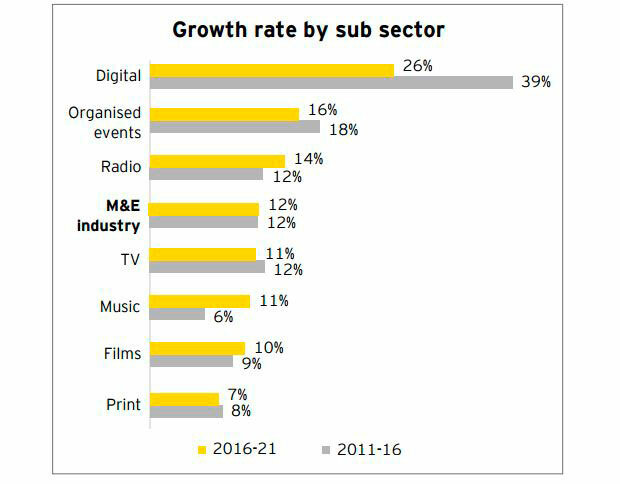 Amongst the sub-sectors in the M&E industry, digital (which includes digital advertising, advertising on mobile, OTT and others) is expected to register the highest growth at 26 per cent CAGR in the 2016-2021 period. This is followed by organised events (expected to grow at 16 per cent CAGR), radio (at 14 per cent CAGR), TV and music (at 11 per cent CAGR, each), films (at 10 per cent CAGR) and print (at 7 per cent CAGR), respectively, in the same period. 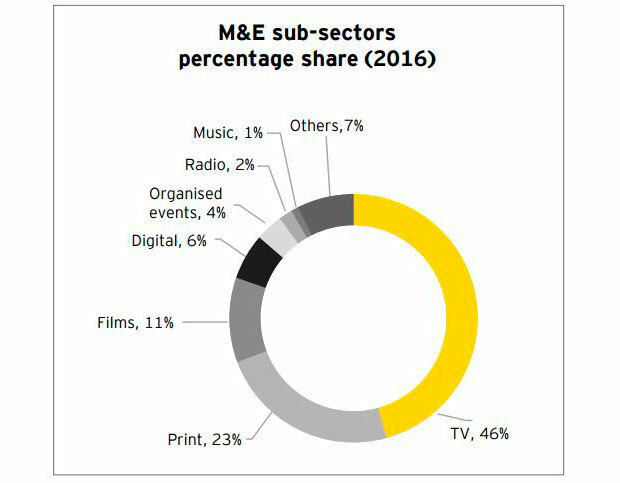 Even if the growth rates of TV and print are lesser than many other sub sectors, the two sub sectors claim about two-thirds of the total pie, while film is the closest next with 11 per cent share. TV accounts for 46 per cent, while print has 23 per cent share. Key drivers in the growth of television sector include the expected growth of the TV households to 200 million by 2020, compulsory digitisation of distribution to grow the subscriber revenues, free TV to grow from 30 to 46 million households by 2020, the growth in sports leagues is attracting increasing sponsorships and higher advertising rates and increasing viewership of regional language channels. The print is growing for the reasons that include growing literacy rate, low cover prices and home delivery, unmatched local coverage (up to 52 editions in a state) and long-time trust in the brands. The report also predicts the subscription market, pegged at USD 9.3 billion in 2016, will grow to USD 15 billion by 2020.